A wonderful and relaxing boat trip (around 1 hour) to the uninhabited tiny pirate island of Gramvousa. Be shipwrecked for the day, swim, snorkel or explore the ruins of the Venetian Fortress perched high on a plateau and marvel at the breathtaking scenery or simply soak up the sunshine. 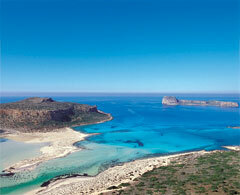 The boat then takes you to the paradise of Balos Bay with its warm shallow waters and stunning pink sand. The beautiful Balos Lagoon is where Prince Charles and Princess Diana spent their honeymoon on the Royal Yacht Britannia.